Kate wore a bespoke coat from Alexander McQueen, one of her favourite designers, keeping with the tradition of wearing green as she has been known to do on the official Irish celebration day. 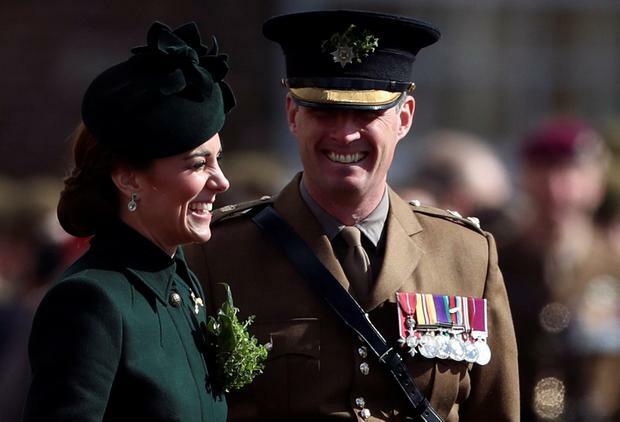 The Duke and Duchess of Cambridge were part of the 1st Battalion Irish Guards St Patrick's Day Parade in Hounslow, England. The children's mental health activist further accessorized her ensemble with Kiki McDonough's diamond earrings with green tourmaline and amethyst. She also added a shamrock pendant to her left shoulder and completed the look with black gloves and heels. Queen Elizabeth The Queen Mother took up the tradition, and upon her death, the Princess Royal handed out shamrocks. Domhnall, which is Gaelic for "world leader", will lead 350 soldiers as they march on the Parade Square at Cavalry Barracks on Sunday morning. The couple were later toasted by the longest-serving Guardsman at the Guardsman's Lunch, and the duchess was formally thanked for presenting the shamrock. At the time, she was very pregnant with Prince Louis. Since 1901, when the regiment was first founded by order of Queen Victoria, the regiment's parade has traditionally been presided over by a woman. Kate Middleton went out for St. Patrick's Day, as she has done most years as a royal with Prince William. In 2014 during William and Kate's royal tour to Australia and New Zealand, they sampled some of the wines at a vineyard in Queensland, New Zealand.